To provide a rigorous foundation for the philosophy more broadly articulated in my books, I have been publishing a series of technical papers in open-access academic journals. This page lists the papers that have already been published, together with a brief description. As more papers are published, they will appear here. None of the journals wherein the papers below have appeared is controlled by a publisher listed in Jeffrey Beall's list of questionable scholarly open-access publishers, as of its version of 12 January 2017. Kastrup, B. (2019). 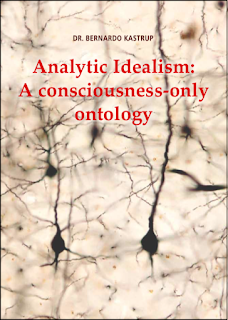 Analytic Idealism: A consciousness-only ontology. Doctoral Dissertation, Radboud University Nijmegen. Alternative download sites at philpapers.org and academia.edu. 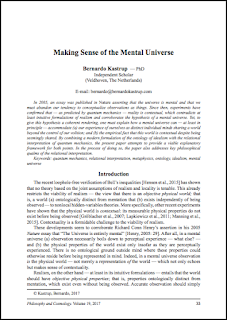 This is my second Ph.D. thesis, on ontology and philosophy of mind. It is not a paper per se, but contains a number of the papers below, plus an explanatory introduction and concluding remarks. My first Ph.D. thesis (2001) was on computer engineering and is not relevant to my philosophy work, at least directly. Therefore, it is not included here. 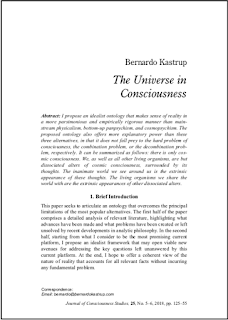 This second thesis, on the other hand, articulates an analytic version of the ontology of idealism, according to which universal phenomenal consciousness is all there ultimately is, everything else in nature being reducible to patterns of excitation of this consciousness. Kastrup, B. (2018). 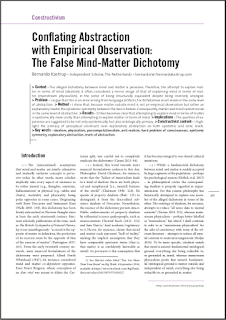 Conflating Abstraction with Empirical Observation: The False Mind-Matter Dichotomy. Constructivist Foundations, Vol. 13, No. 3, pp. 341-361. 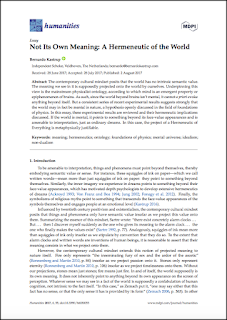 In this article I argue against the alleged dichotomy between matter and mind; that is, I deny that materiality and mentality are jointly exhaustive and mutually exclusive ways of characterizing nature. I argue that the apparent dichotomy is, instead, an artifact of our conflation between language and observation. We do not know matter as we know mind and can never be sure of the former's existence. Mind, in turn, is a given: the matrix within which, and out of which, we construct the theoretical abstraction we call 'matter.' Several sharp, critical peer commentaries follow the paper, as well as my detailed responses to the respective criticisms. Kastrup, B. (2018). The Universe in Consciousness. Journal of Consciousness Studies, Vol. 25, No. 5-6, pp. 125-155. Alternative download sites at philpapers.org and academia.edu. The key idea in this paper has also been discussed on Scientific American. Here I propose an idealist ontology more parsimonious and empirically rigorous than mainstream physicalism, bottom-up panpsychism and cosmopsychism. The ontology also offers more explanatory power than these three alternatives, in that it does not fall prey to the hard problem of consciousness, the combination problem, or the decomposition problem, respectively. It can be summarized as follows: there is only cosmic consciousness. We, as well as all other living organisms, are but dissociated alters of cosmic consciousness, surrounded by its thoughts. The inanimate world we see around us is the extrinsic appearance of these thoughts. The living organisms we share the world with are the extrinsic appearances of other dissociated alters. Kastrup, B. (2018). The Next Paradigm. Future Human Image, Vol. 9, pp. 41-51. Alternative download sites at philpapers.org and academia.edu. An edited excerpt of this paper has also appeared on Scientific American. To perceive the world, we need a subliminal paradigm of thought to interpret raw sensory data and, thereby, create objects and events. As such, the world we see reflects our own unexamined, culture-bound assumptions and expectations, which explains why every generation in history has believed that it more or less understood the world. Today, we perceive a world of objects and events outside and independent of mind, which merely reflects our current paradigm of thought. Anomalies that contradict this paradigm have been accumulated by physicists over the past couple of decades, which will eventually force our culture to move to a new paradigm. Under this new paradigm, a form of universal mind will be viewed as nature’s sole fundamental entity. 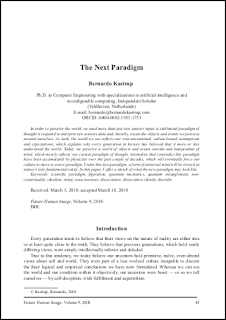 In this paper, I offer a sketch of what the new paradigm may look like. Kastrup, B. (2017). The Quest to Solve Problems That Don’t Exist: Thought Artifacts in Contemporary Ontology. Studia Humana, Vol. 6, No. 4, pp. 45-51. 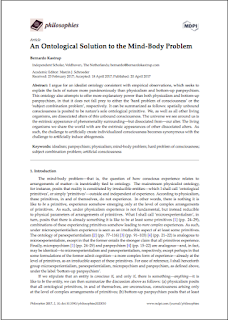 Many modern ontologies, such as physicalism, microexperientialism and cosmopsychism, face seemingly fundamental problems: under physicalism, for instance, we have the ‘hard problem of consciousness,’ whereas under microexperientialism we have the ‘subject combination problem.’ In this paper I argue that these problems are thought artifacts, having no grounding in empirical reality. In a manner akin to semantic paradoxes, they exist only in the internal logico-conceptual structure of their respective ontologies. Kastrup, B. (2017). Making Sense of the Mental Universe. Philosophy and Cosmology, Vol. 19, pp. 33-49. Alternative download sites at philpapers.org and academia.edu. Much of the material covered in this paper has also appeared on Scientific American. This is one of my most daring, yet important, papers. In it, I attempt to provide an idealist ontological underpinning for the relational interpretation of quantum mechanics and avoid its solipsist implications. The idea is that, although all physical aspects of the world are indeed relational and observer-dependent, the meaning and ground of this relationships are given by thoughts, which in turn are non-physical and absolute. The paper defines physicality as the contents of perception. It also attempts to resolve the question of what constitutes proper physical systems. All this should resolve the philosophical qualms of the relational interpretation and make sense of otherwise puzzling implications of quantum theory, such as contextuality. Kastrup, B. (2017). There Is an ‘Unconscious,’ but It May Well Be Conscious. Europe's Journal of Psychology, Vol. 13, No. 3, pp. 559-572. Alternative download sites at philpapers.org and academia.edu. A summary of this paper has also appeared on Scientific American. 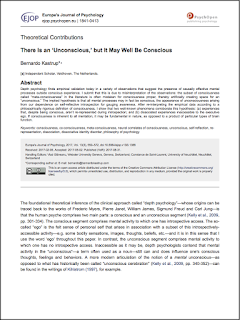 In this psychology paper I address an issue of great significance for philosophy of mind: whether there are indeed unconscious mental processes. I maintain that there aren't, for what we ordinarily and erroneously call 'consciousness' entails metacognition and associative links with the executive ego, in addition to phenomenality proper. The evidence accumulated for unconscious mental processes may represent thus conscious mental processes that (a) escape metacognition or (b) are dissociated from the executive ego. If there are no unconscious mental processes, then consciousness may be primary in nature. Kastrup, B. (2017). Not Its Own Meaning: A Hermeneutic of the World. Humanities, Vol. 6, No. 3, Article 55, doi:10.3390/h6030055. 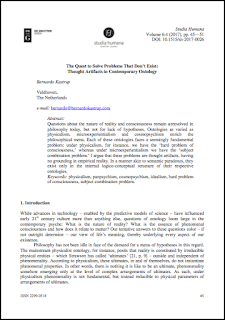 This paper summarizes over three decades of empirical evidence emerging from quantum physics that indicate the mental nature of the world. It then explores the key implication of this hypothesis for how best to live our lives: if the world is mental, then it has intrinsic meaning; that is, the world points to something beyond itself and is amenable to interpretation, just as regular dreams are. In this case, attempts to unveil the immanent, underlying meaning of the world, beyond its mere face-value appearance, become metaphysically and teleologically justified. Kastrup, B. (2017). 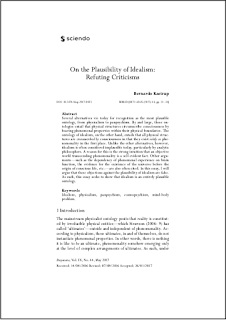 On the Plausibility of Idealism: Refuting Criticisms. Disputatio, Vol. 9, No. 44, pp. 13-34. In this paper I list and then attempt to refute common objections to the philosophy of idealism, according to which the underlying nature of reality is mental. I start by refuting the notion that an objective world transcending mentation is a self-evident fact. Other objections—such as the dependency of conscious experience on brain function, the evidence for the existence of the universe before the origin of conscious life, etc.—are also often refuted. This paper is my go-to resource when I am confronted with critics who raise objections to my philosophical position. If you are an idealist, you can use it in the same way. Kastrup, B. (2017). An Ontological Solution to the Mind-Body Problem. Philosophies, Vol. 2, No. 2, Article 10, doi:10.3390/philosophies2020010. Alternative download sites at philpapers.org and academia.edu. Some of the material covered in this paper has also appeared on Scientific American. This paper contains an analytic, rigorous articulation of the ontology of idealism—according to which reality is entirely mental—from the perspective of classical mechanics, as opposed to quantum mechanics (in a subsequent paper, I articulate the same ontology from a quantum mechanical perspective). The article goes on to compare idealism with physicalism and bottom-up panpsychism in terms of both parsimony and explanatory power. Finally, it discusses the pursuit of artificial consciousness from the perspective of the idealist ontology derived. Kastrup, B. (2017). Self-Transcendence Correlates with Brain Function Impairment. Journal of Cognition and Neuroethics, Vol. 4, No. 3, pp. 33-42. 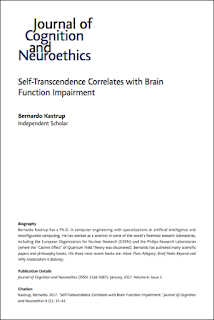 This paper shows a broad pattern of correlations between brain function impairment and an enrichment of inner life often described as self-transcendence. Reduction of oxygen supply to the brain due to strangulation, hyperventilation or G-LOC, reduction of brain activity due to psychoactive substances and self-induced trance, and even brain damage caused by stroke, trauma, dementia or bullet wounds to the head, all are shown to, under certain circumstances, lead to richer inner experiences and savant-level cognitive skills. This suggests that normal brain function corresponds to a localization or dissociation of consciousness, not its production. Impairment of brain function thus corresponds to a reduction of such localization or dissociation. Kastrup, B. (2016). 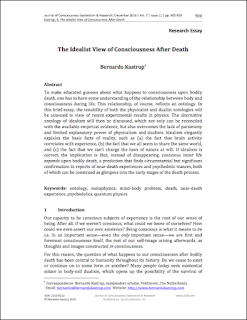 The Idealist View of Consciousness After Death. Journal of Consciousness Exploration and Research, Vol. 7, No. 11, pp. 900-909. Here I first summarize laboratory results related to quantum entanglement, which render realism—the notion that reality exists outside and independent of mind—untenable. I then proceed to offer an idealist, mind-only ontology to make sense of reality, according to which brains correspond to dissociations of universal consciousness. Finally, I show that reports of near-death experiences and other instances of brain function impairment reflect precisely what this idealist ontology predicts: an expansion of inner life. I thus propose that the first-person view of the death process must correspond to an expansion of awareness. Kastrup, B. (2016). The Physicalist Worldview as Neurotic Ego-Defense Mechanism. SAGE Open, doi: 10.1177/2158244016674515. Physicalists—that is, those who believe that matter exists independently of experience, and that experience is generated by certain arrangements of matter in the form of biological nervous systems—often accuse those who hold different views of lack of objectivity and wish-fulfillment. This paper shows that physicalism is itself largely motivated by a subjective need for meaning and self-validation. Unlike the way it is often portrayed by its proponents, physicalism is far from an emotionally unbiased worldview. Kastrup, B. (2016). 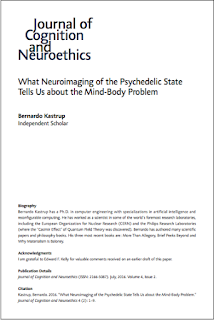 What Neuroimaging of the Psychedelic State Tells Us about the Mind-Body Problem. 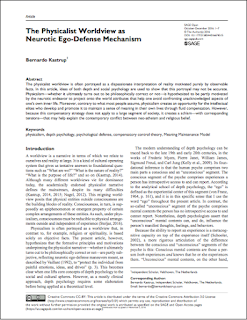 Journal of Cognition and Neuroethics, Vol. 4, No. 2, pp. 1-9. Several neuroimaging studies have now shown that psychedelic substances, despite causing an unfathomable enrichment of experience, are accompanied by broad reductions of neural activity, or metabolism. In this paper, I review these studies and analyze the implications of their results for physicalism—that is, the notion that experience is generated by brain activity—casting doubt on the latter.